We will take you to see more of our beautiful beaches around the places that you are staying usually within no more than 1,5hrs of driving. From the COCO/PAPAGAYO-AREA: We’ll visit the beautiful white sand beaches of Playa Flamingo, Playa Penca and Playa Danta that are located south from where you are staying and are amongst the most beautiful of the country. At Playa Danta you will have the chance to catch a great lunch in a beautiful setting on the beach front! From the FLAMINGO/CONCHAL-AREA: We’ll take you either South to Playa Avellanas and Playa Tamarindo (good surf beaches – not ideal for little kids) or North to explore the beaches of Playa Ocotal, Playa Hermosa, Playa Papagayo and Playa de Coco where you will be able to have lunch and buy some souvenirs. *A fun trip to explore our beautiful beaches and beach towns! On this trip we will take you on a horseback ride for around 2hrs around the beaches of Playa Brasilito and Playa Conchal while enjoying the beautiful natural surroundings! Transportation is courtesy from Flamingo/Potrero/Conchal areas only – please inquiry rates from Coco! Sailing along our beautiful coastline and great chances of spotting our marine life (sea turtles, dolphins and even whales) while being catered with drinks and snacks is one of the nicest ways to spend an afternoon (or morning!) on the Pacific Ocean! Included in the trip is a guided snorkeling tour around the reefs of a secluded cove, where we will anchor while the crew prepares a delicious meal (sandwiches or fajitas, chips & salsa, guacamole, etc..) on the boat. 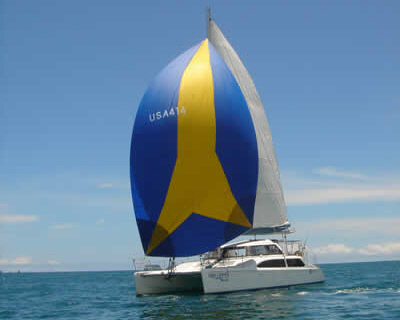 We offer either shared or private trips on the best operated Sailboats/Catamarans around Flamingo! Fun for the whole family! *The most beautiful day on the ocean for any age - just sit back, relax and enjoy the tour! There is almost no place where you can't get to with the 4-wheelers! We offer a variety of different ATV trips in our closer area around Flamingo/Potrero between beaches, rugged back roads, hillsides and muddy swamps! We have something for any taste! Our machines are well maintained, licensed and insured and guarantee for a perfect adventure! Drivers need to have license and minimum 16 years of age! * Great way to explore the beach areas while mixing adventure with sightseeing!